Lot:9440 Fr. 2301m. 1934 Mule $5 Hawaii Emergency Note. PCGS Currency Superb Gem New 68 PPQ. Fr. 2301m. 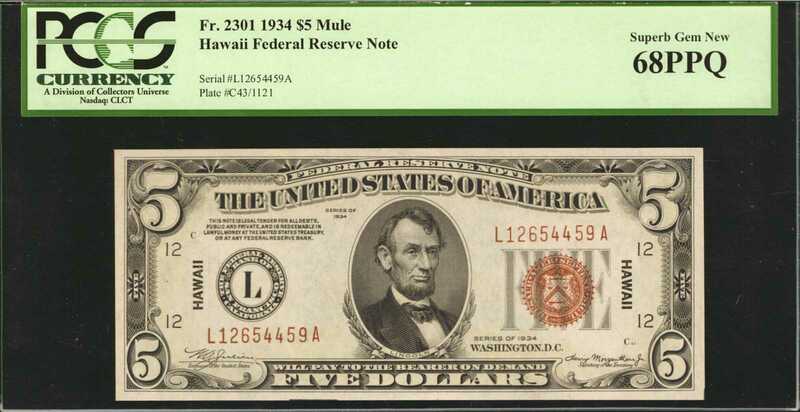 1934 Mule $5 Hawaii Emergency Note. PCGS Currency Superb Gem New 68 PPQ.One of the most important emergency issue small-size notes we have handled in recent memory and a true one of. PMG and PCGS Currency have combined to certify just this piece at the Superb Gem 68 level for any 1934 plain Five Dollar Hawaii note. When also considering the 1934A series notes the total swells to just three pieces at the 68 level with PCGS Currency and PMG both having certified just a single example. Looking closely at the note makes it quite easy to see why such a lofty designation was applied. Precise inks making up both the face and back impressions are seen with near perfect registration to each other. The margins are large and even while the originality is unquestionable. This note will likely long be the single finest available as being the lone example to achieve the grade in well over 10 years of certification is certainly impressive.